KARACHI: District Central of Karachi has been facing one of the most severe water crises in its history. Residents of the district have been receiving little water through lines. The government had provided an alternative solution to the problem in the form of the hydrant at Sakhi Hasan from where people could purchase tankers at cheap rates. However, the hydrant is no more effective in dealing with the crisis as its water supply has also been drastically reduced. People blamed officials of the Karachi Water and Sewerage Board (KWSB) for the water scarcity, alleging that the water supply to District Central was stopped on their orders. Several parts of District Central have not been supplied with water for the past several days. They include Buffer Zone, North Karachi, New Karachi, Nazimabad, North Nazimabad, Federal B Area and Liaquatabad. According to some reports, the water shortage has been deliberately created to patronise the tanker mafia. “There was no water crisis in District Central,” a source said, adding that the crisis was engineered by officers of the water board six months ago, after which citizens began to queue up at the hydrant for water tankers. Later, water supply to the hydrant was also curtailed to add to the miseries of the residents of District Central. To exploit the situation, water tankers have increased their charges and the cost of procuring a 1,000-gallon water tanker has soared up to Rs3,000 to Rs4,000. Due to decreased water supply, the hydrant at Sakhi Hasan is no longer able to supply water to all the applicants. After submitting applications, people have to wait for three to four days before a water tanker is provided to them. The citizens of District West are, likewise, suffering from water shortage. As water is not being supplied through lines and tankers charging exorbitant rates, protest demonstrations in different parts of the district have become a routine. Residents of the district held on Monday a protest outside the KWSB office where they chanted slogans against the water board and the tanker businesses. 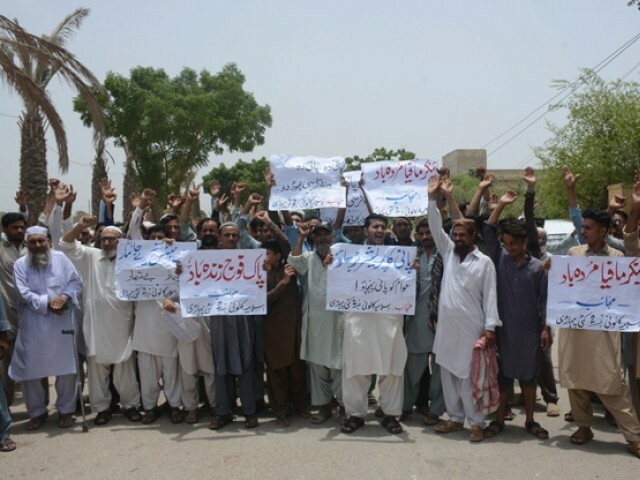 The protesters claimed that many areas of District West, including Mominabad, Metroville, Qasba Colony, Pathan Colony, Frontier Colony and Pirabad, had been facing acute shortage of water for several days. According to the demonstrators, the water crisis had made their lives miserable as they even did not have water for cooking and drinking. “We have been longing for even a drop of water” a resident decried. “Hydrants are charging exorbitant rates for water tankers while water lines remain empty,” he added. Before entering the office, the protesters claimed that their earlier negotiations with the KWSB authorities did not bear any fruit as they continued to suffer from water shortage. A resident lamented that District West had always been deprived of water. “We have been deprived of water for ages, even when other areas of the city had no concept of water shortage,” he said. The participants warned that they would hold protests daily if the authorities did not arrive at a lasting solution to their problem.